زارعی, فاطمه, قرایلو, مریم, علیزاده چوبری, امید. (1396). تأثیر هواویزها بر بارش در شرایط رطوبت‌های نسبی متفاوت: مطالعه موردی. 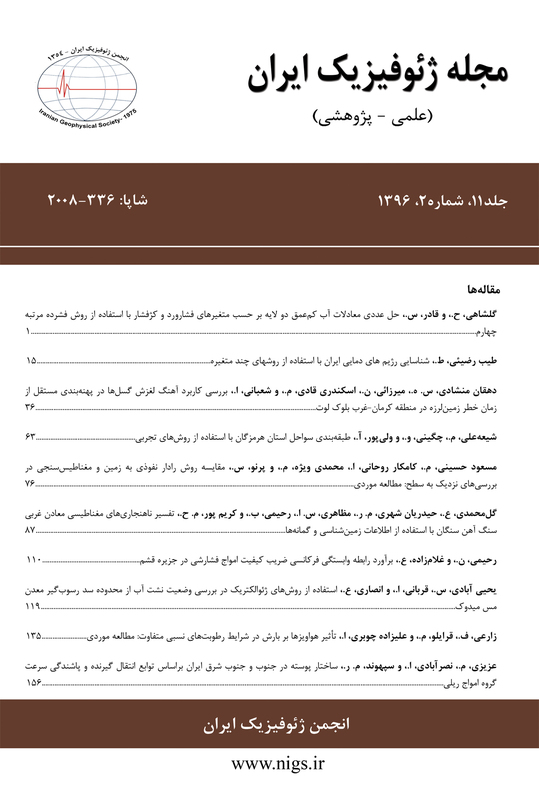 مجله ژئوفیزیک ایران, 11(2), 135-155. فاطمه زارعی; مریم قرایلو; امید علیزاده چوبری. "تأثیر هواویزها بر بارش در شرایط رطوبت‌های نسبی متفاوت: مطالعه موردی". مجله ژئوفیزیک ایران, 11, 2, 1396, 135-155. زارعی, فاطمه, قرایلو, مریم, علیزاده چوبری, امید. (1396). 'تأثیر هواویزها بر بارش در شرایط رطوبت‌های نسبی متفاوت: مطالعه موردی', مجله ژئوفیزیک ایران, 11(2), pp. 135-155. زارعی, فاطمه, قرایلو, مریم, علیزاده چوبری, امید. تأثیر هواویزها بر بارش در شرایط رطوبت‌های نسبی متفاوت: مطالعه موردی. مجله ژئوفیزیک ایران, 1396; 11(2): 135-155. تغییر تعداد هواوبزهایی که به‌عنوان هسته‌های میعان درون قطرک ابر فعال می‌شوند، تأثیر قابل ملاحظه‌ای بر ویژگی‌های خردفیزیک ابر می‌گذارند، به‌نحوی که می‌توانند مقدار و الگوی بارش را تغییر دهند. در این مطالعه با استفاده از طرح‌وارۀ خردفیزیک ابر تامپسون موجود در مدل WRF، تأثیر هواویزها بر بارش در یک رخداد توفان تندری بررسی شد. داده‌های مربوط به هواویزها از مدل جهانی GOCART استخراج و به مدل WRF خورانده شد، درحالی‌که برای شرایط اولیه و مرزی هواشناسی از داده‌های FNL استفاده گردید. دو آزمایش عددی که معرف هوای پاک و آلوده هستند انجام گرفت که در آن‌ها تعداد هواویزهای آب‌دوست به‌ترتیب به 2/0 و 5 برابر غلظت استخراج‌شده از مدل GOCART تغییر یافت. نتایج شبیه‌سازی‌ها نشان داد که توزیع مکانی بارش در دو حالت پاک و آلوده متفاوت است، به‌نحوی که در جوّ آلوده در برخی مناطق فراهنج‌های شدیدتری وجود دارد که بارش‌های شدیدتری را نیز در پی دارد. افزایش فراهنج‌ها در این مناطق سبب می‌شود که زمان رشد آب‌شهاب‌ها طولانی‌تر و اندازه‌شان بزرگ‌تر گردد؛ درنتیجه زمانی که از پایۀ ابر فرو می‌افتند کمتر تبخیر و ذوب می‌شوند و از این‌رو افزایش بارش سطحی را در این مناطق موجب می‌شوند. از طرفی کاهش بارش در حالت آلوده در مناطق پایین‌دست جریان باد شبیه‌سازی شد؛ که دلیل آن کاهش شعاع بلورهای یخ است که به کاهش فرایند یخ‌زدگی و تولید گویچۀ برف منجر می‌شود. همچنین، بررسی آهنگ ساعتی بارش نشان داد در ساعت‌هایی که رطوبت نسبی جوّ زیاد است و بخار آب به‌اندازۀ کافی در جوّ وجود دارد، افزایش تعداد هواویزهای آب‌دوست سبب افزایش بارش سطحی می‌شود. در حالی که در ساعت‌هایی که رطوبت نسبی جوّ کم است، کاهش بارش و گاهی توقف کامل بارش وجود دارد. Although cloud properties and precipitation formation are primarily affected by atmospheric dynamics, cloud microphysical features also play key roles. The aerosol number concentration strongly influences cloud microphysics and precipitation formation, mainly through affecting the formation of cloud droplets and ice crystals. In the current research, using the Thompson aerosol-aware microphysics scheme implemented on the Weather Research and Forecasting (WRF) model, the effects of aerosol number concentration was investigated on the precipitation formation of a heavy rainfall in Tehran. The aerosol number concentrations were obtained from the Goddard Global Ozone Chemistry Aerosol Radiation and Transport (GOCART) model, while the National Center for Environmental Prediction Final Analysis (NCEP/FNL) dataset was used for the initial and lateral boundary conditions. Two numerical simulations were conducted, referred to as the clean and polluted experiments. The initial hygroscopic aerosol number concentrations, compared to the values obtained from the GOCART model, were reduced to one-fifth and increased by a factor of 5 in the clean and polluted experiments, respectively. The model simulations were run with three nested domains, with horizontal resolutions of 21, 7 and 2.3333 km, and 45 levels in the vertical position, reaching up to the 50 hPa level. Simulations were conducted for 30 hours, starting from 18:00 UTC April 13, 2012, from which, the first 6 hours were considered as the model spin-up. The Rapid Radiative Transfer Model (RRTM; Mlawer et al., 1997) was used for the shortwave and longwave radiation, respectively. The land surface scheme and surface layer scheme were based on the five-layer thermal diffusion and the revised MM5 similarity theory, respectively (Zhang and Anthes, 1982). The non-local Yonsei University (YSU) scheme was employed for the parameterizations of the boundary layer processes (Hong et al., 2006). The Kain-Fritsch scheme (Kain, 2004) was used to parameterize moist convection in the mother and first nested domains, while it was explicitly modelled in the innermost domain. Results indicated that changes in the aerosol number concentration are associated with changes in the spatial distribution of precipitation. Stronger updraft cores were found in the polluted experiment, entailing higher precipitation, longer growth times, and larger sizes of hydrometeor; accordingly, more raindrops survived from the evaporation after falling from the cloud base, increasing the surface precipitation. On the other hand, surface precipitation decreased in the downstream, primarily due to the decrease in the effective radii of ice crystals, reducing the riming processes and the amounts of graupels. Results further indicated that the increase in the aerosol number concentration is associated with the increase in the rate of precipitation under high relative humidities, while the reverse is true when the available water vapour is relatively low. Ackerman, A. S., Toon, O. B., Stevens, D. E., Heymsfield, A. J., Ramanathan, V., and Welton, E. J., 2000, Reduction of tropical cloudiness by soot. Science, 288(5468), 1042-1047. Albrecht, B. A., 1989, Aerosols, cloud microphysics, and fractional cloudiness. Science, 45(4923), 1227-1230. Alizadeh-Choobari, O. and Gharaylou, M., 2017, Aerosol impacts on radiative and microphysical properties of clouds and precipitation formation: Atmospheric Research, 185, 53-64. Andreae, M. O., Rosenfeld, D., Artaxo, P., Costa, A. A., Frank, G. P., Longo, K. M., and Silva-Dias, M. A. F., 2004, Smoking rain clouds over the Amazon. Science, 303(5662), 1337-1342. Charlson, R. J., Schwartz, S. E., Hales, J. M., Cess, R. D., Coakley, J. J., Hansen, J. E., and Hofmann, D. J., 1992, Climate forcing by anthropogenic aerosols. Science, 255(5043), 423-430. Chin, M., Ginoux, P., Kinne, S., Torres, O., Holben, B. N., Duncan, B. N., Martin, R. V., Logan, J. A., Higurashi, A. and Nakajima, T., 2002, Tropospheric aerosol optical thickness from the GOCART model and comparisons with satellite and Sun photometer measurements: Journal of the Atmospheric Sciences, 59(3), pp.461-483. Colarco, P., da Silva, A., Chin, M. and Diehl, T., 2010, Online simulations of global aerosol distributions in the NASA GEOS‐4 model and comparisons to satellite and ground‐based aerosol optical depth. Journal of Geophysical Research: Atmospheres, 115(D14). Eidhammer, T., DeMott, P. J. and Kreidenweis, S. M., 2009, A comparison of heterogeneous ice nucleation parameterizations using a parcel model framework. Journal of Geophysical Research: Atmospheres, 114(D6). Fan, J., R. Zhang, G. Li, and W.-K. Tao., 2007a, Effects of aerosols and relative humidity on cumulus clouds. Journal of Geophysical Research, 112, D14204, doi : 10.1029/2006JD008136. Fan, J., R. Zhang, G. Li, W.-K. Tao, and X. Li., 2007b, Simulation of cumulus clouds using a spectral microphysics cloudresolving model. Journal of Geophysical Research, 112, D04201, doi:10.1029/ 2006JD007688. Fan, J., Yuan, T., Comstock, J.M., Ghan, S., Khain, A., Leung, L.R., Li, Z., Martins, V.J. and Ovchinnikov, M., 2009, Dominant role by vertical wind shear in regulating aerosol effects on deep convective clouds. Journal of Geophysical Research: Atmospheres, 114(D22). Feingold, G. and Heymsfield, A. J., 1992, Parameterizations of condensational growth of droplets for use in general circulation models. Journal of the Atmospheric Sciences, 49(23), 2325-2342. Ginoux, P., Chin, M., Tegen, I., Prospero, J. M., Holben, B., Dubovik, O., Lin, S. J, 2001, Sources and distributions of dust aerosols simulated with the GOCART model: Journal of Geophysical Research, 106, (D17), 20255–20273. Janjic, Z., 1996, The Mellor-Yamada level 2.5 scheme in the NCEP eta model, paper presented at 11th Conference on Numerical Weather Prediction, American Meteorological Society, Norfolk, Va., 19– 23 Aug.
Kain, J. S., 2004, The Kain-Fritsch convective parameterization: An update. Journal of Applied Meteorology, 43, 170-181. Khain, A., Rosenfeld, D. and Pokrovsky, A., 2005. Aerosol impact on the dynamics and microphysics of deep convective clouds. Quarterly Journal of the Royal Meteorological Society, 131(611), 2639-2663. Khain, A. P., BenMoshe, N., and Pokrovsky, A., 2008, Factors determining the impact of aerosols on surface precipitation from clouds: An attempt at classification: Journal of the Atmospheric Sciences, 65(6), 1721-1748. Khain, A. P., 2009, Notes on state-of-the-art investigations of aerosol effects on precipitation: a critical review: Environmental Research Letters, 4(1), 015004. Koren, I., Kaufman, Y. J., Rosenfeld, D., Remer, L. A., and Rudich, Y., 2005, Aerosol invigoration and restructuring of Atlantic convective clouds: Geophysical Research Letters, 32(14), L14828-1. Lebo, Z. J., and Morrison, H., 2013, A novel scheme for parameterizing aerosol processing in warm clouds. Journal of the Atmospheric Sciences, 70(11), 3576-3598. Lee, S. S., Feingold, G., and Chuang, P. Y., 2012, Effect of aerosol on cloud–environment interactions in trade cumulus. Journal of the Atmospheric Sciences, 69(12), 3607-3632. Levin, Z., and Cotton, W. R., 2008, Aerosol pollution impact on precipitation: a scientific review. Springer. cumulus. Journal of the Atmospheric Sciences, 69(12), 3607-3632. Li, G., Wang, Y. and Zhang, R., 2008. Implementation of a two‐moment bulk microphysics scheme to the WRF model to investigate aerosol‐cloud interaction. Journal of Geophysical Research: Atmospheres, 113(D15). Lin, J. C., Matsui, T., Pielke, R. A., and Kummerow, C., 2006, Effects of biomass‐burning‐derived aerosols on precipitation and clouds in the Amazon Basin: A satellite‐based empirical study. Journal of Geophysical Research: Atmospheres, 111, D19204. Liu, J., Zheng, Y., Li, Z. and Cribb, M., 2011, Analysis of cloud condensation nuclei properties at a polluted site in southeastern China during the AMF‐China Campaign. Journal of Geophysical Research: Atmospheres, 116(D16). Mashayekhi, R. and Sloan, J. J., 2014, Effects of aerosols on precipitation in north-eastern North America: Atmospheric Chemistry and Physics, 14(10), 5111-5125. Miller, R. C., 1972, Notes on analysis and severe-storm forecasting procedures of the Air Force Global Weather Central (No. AWS-TR-200-REV). Air Weather Service Scott AFB IL. Mlawer, E. J., Taubman, S. J., Brown, P. D., Iacono, M. J., Clough, S. A., 1997, Radiative transfer for inhomogeneous atmospheres: RRTM, a validated correlated-k model for the longwave: Journal of Geophysical Research. 102 (D14), 16663–16682. Petters, M. D. and Kreidenweis, S. M., 2007, A single parameter representation of hygroscopic growth and cloud condensation nucleus activity. Atmospheric Chemistry and Physics, 7(8), 1961-1971. Pöschl, U., 2005, Atmospheric aerosols: composition, transformation, climate and health effects: Angewandte Chemie International Edition, 44(46), 7520-7540. Qian, Y., Gong, D., Fan, J., Leung, L. R., Bennartz, R., Chen, D. and Wang, W., 2009, Heavy pollution suppresses light rain in China: Observations and modeling. Journal of Geophysical Research: Atmospheres, 114(D7). Rosenfeld, D., 1999, TRMM observed first direct evidence of smoke from forest fires inhibiting rainfall: Geophysical Research Letters, 26(20), 3105-3108. Rosenfeld, D., Lohmann, U., Raga, G. B., O'Dowd, C. D., Kulmala, M., Fuzzi, S., Reissell, A. and Andreae, M. O., 2008, Flood or drought: how do aerosols affect precipitation? : Science, 321(5894), 1309-1313. Seifert, A., and Beheng, K. D., 2006, A two-moment cloud microphysics parameterization for mixed-phase clouds. Part 2: Maritime vs. continental deep convective storms: Meteorology and Atmospheric Physics, 92(1-2), 67-82. Tao, W. K., Chen, J. P., Li, Z., Wang, C., and Zhang, C., 2012, Impact of aerosols on convective clouds and precipitation: Reviews of Geophysics, 50, RG2001. Teller, A. and Levin, Z., 2006, The effects of aerosols on precipitation and dimensions of subtropical clouds: a sensitivity study using a numerical cloud model: Atmospheric Chemistry and Physics, 6(1), 67-80. Thompson, G., and Eidhammer, T., 2014, A study of aerosol impacts on clouds and precipitation development in a large winter cyclone: Journal of the Atmospheric Sciences, 71(10), 3636-3658. Twomey, S., 1977, The influence of pollution on the shortwave albedo of clouds: Journal of the Atmospheric Sciences, 34(7), 1149-1152. Wang, C., 2005, A modeling study of the response of tropical deep convection to the increase of cloud condensation nuclei concentration: 1. Dynamics and microphysics. Journal of Geophysical Research: Atmospheres, 110(D21). Wang, Y., Wan, Q., Meng, W., Liao, F., Tan, H. and Zhang, R., 2011, Long-term impacts of aerosols on precipitation and lightning over the Pearl River Delta megacity area in China: Atmospheric Chemistry and Physics, 11(23), 12421-12436. Wang, Y., 2015, Aerosol-Cloud Interactions from Urban, Regional, to Global Scales. Springer. Zhang, D., and Anthes, R. A., 1982, A high-resolution model of the planetary boundary layer-sensitivity tests and comparisons with SESAME-79 data. Journal of Applied Meteorology, 21(11), 1594–1609. Zhang, R., Li, G., Fan, J., Wu, D. L., and Molina, M. J,2007, Intensification of Pacific storm track linked to Asian pollution Proceedings of the National Academy of Sciences 104(13), 5295-5299.